Rest in peace brother, we'll take it from here. Thank you for your many years of service, you will not be forgotten. God bless the family, friends, and co-workers of Sgt Hinkle during this time of tragic and senseless loss. Godspeed Sgt. Hinkle. Your service will always be appreciated and you will never be forgotten. Bless the members of the Sullivan County Sheriff's Office. Please stay diligent in your time of grief. Officer Bryan Bates , Knox County Sheriffs Office ,, Knoxville Tn. On behalf of POINT 27, we would like to offer condolences for Sergeant Steve Hinkle. Please know we are eternally grateful for Steve’s service and his ultimate sacrifice. 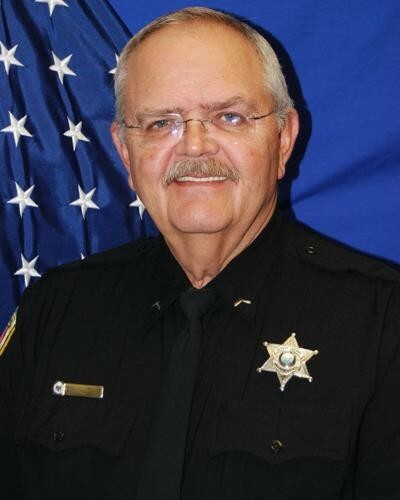 To honor Sergeant Hinkle, POINT 27 sent 27 Thin Blue Line Dog Tag Necklaces, engraved with “Blessed are the Peacemakers for they will be called children of God” Matthew 5:9, to the Sullivan County Sheriff’s Department, for Steve’s partner and fellow deputies. POINT 27 sent Folded Flag Necklaces engraved with “Greater Love has no one than this; than to lay down one’s life for one’s friend” John 15:13 for Sergeant Hinkle’s family. Prayers and thoughts for the immediate family and fellow officers. Thank you Seargent Hinkle for your service and sacrifice. God bless all our first responders. Osceola County Sheriff Office, Florida. Heroes live forever. Never forgotten. Prayers to family and friends. Deepest Sympathy to the family of Sgt. Hinkle and to the Brothers and Sisters of the Sullivan County Sheriff Department Tennessee. May they all find Peace of mind for their loss. Final Salute Sergeant Hinkle. Thank you for your service. You are a hero. Rest peacefully in the presence of God. We are praying for the family and fellow officers. Very sorry for the loss of this officer. Thank you for your service. R.I.P. prayers to all. Rest In Peace my brother. Until Valhalla. We have the watch from here. My thoughts and prayers are with the Family and the great men and women of the Sullivan County SO. The Great State of Tennessee has lost another hero. Rest in Peace brother Hinkle. Thank you Sergeant Hinkle for your dedication and for paying the ultimate price for the fine folks in the great state of Tennessee. You are a true American Hero !!!! My thought and prayers are with your family, friends and co-workers. May you forever, rest in peace, my brother. My God welcome you to his table with our falling brothers and sisters RIP BROTHER. Sending my sincere thoughts and prayers to the family, friends and department of Sgt. Hinkle. I am so very sorry for the loss of your loved one. Thank you for your lifetime of loyal, dedicated and selfless service to your community. You will live on in the hearts of all who love and cherish you. May God bless you and keep you. RIP HERO.